Listener Comments is back for its third round. The segment where listeners are welcome to share their thoughts, greetings and get their questions answered directly by me. 01:35 – Are you suffering from inbox overload? Welcome back listener, this is James Schramko and this is a special Listeners Comments episode. This is the third one of the series. The first two were really popular and I think it’s because you get to hear from real listeners on the SuperFastBusiness show. People are dialing in and leaving messages, you can do this by going down to the bottom of the site on SuperFastBusiness.com and using the “Leave Voice Message” option and using the microphone on your computer, you can leave your voice for me. And if you get featured in the show, then I will answer your question or if it’s just a comment then I’ll play that and I really want to know how you’re going. I’ve got a sense that you’re enjoying the show because with three-and-a-half thousand page views a day, SuperFastBusiness is getting really strong and that’s because I’m using the OwnTheRacecourse methodology. If you want to understand how that works, go to OwnTheRacecourse.com and put your email address. You’ll be able to get the entire course for free, this used to be a paid course but you can get it for free, and it will show you how to build a powerful authority blog just like SuperFastBusiness.com, which is actually the case study. Alright, let’s get straight to the listener questions and here we go. James: Yup buddy, it actually does work, so let’s try again. Listener: Hi James, this is John Rose. I just switched over to your weekly update. I get a lot of emails and I was having trouble with just your daily updates just been giving you the time that it deserves. So hopefully with the weekly updates, I’ll be able to spend a little bit more time reading some of your material and using it to help me build my business. So, hopefully that will work because I just get too much, too many emails and we’ll see if that will work so I guess I could give you the time it deserves. Thanks, bye. James: Hey John, thank you. Listen, email is such a huge problem for most entrepreneurs and I suspect most people just get to their computer, open up the email and then, the next few hours, are being bombarded with sales messaging. They might go and buy a course because there’s a very compelling sales copy, they never finish it and then the same little “rat race” happens next day back on the treadmill. You’ve got to cut down your emails. Certainly with my emails, you can click on the link that says “Send it to me weekly”. Another great thing you can do is go to iTunes, there’s actually a link to my iTunes channel on the top of SuperFastBusiness.com. Click on that and subscribe so that you automatically get the audio versions of every post then you can listen to it while you’re walking the dog, going to the gym or doing something like catching a bus. So, that’s one way to really get these short messages. Most of my podcasts are only a few minutes long and the feature ones like this are generally under half an hour. So, get that subscription happening and go back to your email and see what you can do to cull it right down. There is a course called Inbox Relief, and this has saved hundreds of people from the dreaded inbox overload. I’ve certainly been using these principles for years to get the control of my inbox, but here’s the bottom line, you are either receiving emails or sending emails. Now, the reason I can create a piece of content and send it out pretty much every day is because I’m not reading all the crap that marketers are sending. I don’t need all that stuff. Apart from a good internet connection, a good computer and an idea about how I can solve problems for my customers, I don’t really need to learn a whole lot more or be bombarded with sales messages or buy the latest greatest book because someone’s going to give me a free course or whatever, that is just “noise”. Cut it right down to the bare basics. Really, with just the SuperFastBusiness tips and a few other very very select email subscriptions, you should be able to get ahead and just cut down. So there you go. Go on an email diet, select the weekly option by all means and I’ve got a surprise coming for you with the weekly option. I’m going to actually be sending a weekly digest on my blog with links to the previous weekly digest so you can actually fast track through all the very best posts through the entire blog. And here’s another tip. On SuperFastBusiness.com, right after the post is the Related Posts option and that should pull up related posts. So if you like what you’re reading, click through to the next one, and I know this is working. This is how I know, I’ve got a bounce rate of just 5 percent on my top posts. So I’ve done ones about “unboxing my latest Apple MacBook Pro”, I’ve got one about “what to do if you get stuck” and I’ve got one about “how to put together a proper training course”. So these posts are getting really really low bounce rates, which means people are liking it and clicking through to the next one. So even if you set a calendar alert to come and visit my blog once a week, even if you didn’t need to get the email, that would be a great start. I hope that’s helpful John. Listener: Hey James, it’s Mike Redding from GoogleAppsforedu.com, just wanted to ask you a question about pricing. We’re just working on a new initiative with Google to create an online community of teachers that use Google in school and was just wondering how we go about pricing it for different countries where teachers are interested. Obviously, different countries have different amounts of money in their education budgets and different schools have different amounts of money and teachers are paid different rates and so on. So I was just wondering if you would suggest we just charge a same price regardless of country or whether or not you can actually adjust your rates and then maybe a little bit about how you’d come to that decision and do some research on that. Look forward to hearing back from you. James: Mike, that’s one of the most interesting questions I’ve ever had. What you could do is you could start off by checking out the Big Mac Index which the economist.com runs and it compares the price of a Big Mac in every country to give you an indication of spending power. So, that’s one thing you could do and it might give you an indication as to how much you might charge in different countries. I usually stick with the big markets for my products. So I’m after the USA, Canada, Australia, Europe, UK, New Zealand and also Dubai, interestingly enough. Now, those markets, I’m charging the same price for every market because we have quite a global economy now where you could put up a US dollar price and that price would be understood by most countries. So that’s how I run it unless I’m having something that is an event in Australia where I’ve got considerations such as GST. Now, you may have the same thing as well so you’re going to have to look at VAT, GST and where your company is based, these things may determine how you charge. When I have a GST implication, I usually just include that in the same price. So if someone purchased a US dollar product and they’re in Australia, then it’s GST inclusive and I indicate that on the receipt. So, some of the things that you’re going to have to consider are your shopping cart features, the taxation implications based on where you’re selling, where your country is, where your buyer is, and of course, how much spending capacity some countries have. Also, you’re going to have to look, because of the type of thing you’re doing, you’re probably dealing with government agencies and there may even rebates or rules. I know for example in South Africa, they had big incentive schemes for automotive dealers to do training and they had a big budget for that so the car dealers had a lot more spending power than in other countries to buy automotive educational products. So, there’s a few indicators for you, I hope that helps. Good luck with it, it sounds like an amazing project and perhaps you could come back and tell us how you get on with it. Listener: Schrammy, this is Clay. Hey, I hope you’re having an amazing, amazing, amazing day. Thank you for all that you’ve done for the IM world, for the marketing world and for my company. Have a great wonderful day, bye. James: Aaah, Clay Collins, thank you for your enthusiastic message and I love that you’re interacting with the site. Hey, thanks so much for making LeadPages because I’m now getting around 60 opt-ins a day from SuperFastBusiness.com using the little banner on the sidebar there, the free training banner, and I’ve just installed a welcome gate on ThinkActGet.com, one of my other podcasts, and the opt-ins just went “swoosh” through the roof like the same day it was installed and the same thing happened on BuyWithBonus.com. So listener, go and check out any of the interviews that I’ve done with Clay Collins, you could use the search tool on SuperFastBusiness, it’s really powerful, it’s powered by Google. So use the search tool on SuperFastBusiness.com and search for Clay Collins, you’ll check out the LeadPages interviews, you’ll find out why he’s such a spectacular marketer but the product is amazing. Listener: Hi James, Ezra, thank you very much for that podcast. It’s amazing how much great content you guys manage to cram in thirty minutes. Questions James were fantastic and Ezra really like your enthusiasm for ecommerce and I appreciate the resources as well. Thanks again. James: Thanks Douglas. Douglas was taking about the Ezra Firestone ecommerce interview on SuperFastBusiness.com. That was an amazing podcast because I attended Traffic and Conversions Summit where Ezra was the feature speaker. He has really successful ecommerce stores, he’s been implementing OwnTheRacecourse to them, getting fantastic results and I sat in his presentation and I took a lot of notes. So that whole podcast was really driven by the notes I took having sat through his presentation and I was able to go straight for the good bits. So as an interviewer, if you’re doing this on your podcast or your video show or you have interviews with anyone even if it is written, see if you can do some research before the interview. If you can do that, you will get a better interview because you know what to ask to get the best performance from your talent. So check out the ecommerce interview. By the way, I think ecommerce is going to be so big that I’ve got Ezra Firestone flying over here to FastWebFormula 4 in Sydney, in June 2013. So depending on when you’re listening to this, you could meet Ezra live. He is also my co-host in the ThinkActGet podcast so I’m really looking forward to catching up with Ezra and ecommerce is going to be huge within our community. So, SuperFastBusiness members are getting pretty excited about it because the big companies are really struggling. A lot of retail stores are closing and that means consumers are going to go online, so you really want to get on to this ecommerce stuff while you have that huge opportunity to just come and take and plunder from the big corporations. Thanks Douglas. Listener: Hello James, hey Kenelis here from Chicago. Been following you for a couple of weeks, thinking about joining your forum and I have one quick question regarding websites that have a squeeze page with a double opt-in, and the website is in https versus http. I’m finding here with my https website that when somebody hits the instant access button after submitting their email, a pop-up shows warning them that they are going to be over an encrypted connection but it is not guaranteed that it’s safe. And I was wondering, do you recommend a way around that pop-up occurring or do you recommend not having an https or a site that requires an https, what would be the work around? Because, it seems that one extra click after they’ve already hit the access button warning them to potentially not proceed to the next page could cause a decline in conversions. Thank you for your time, cheers buddy. James: Hey Harry, you should absolutely NOT have the https for your opt-in. If they’re having a message like that, I’m sure it’s disconcerting and I have no doubt you’ll be able to increase your conversions dramatically. Firstly, check out LeadPages because that can be hosted on the LeadPages site and you can simply redirect people with a redirect on your normal site. So if you have no other option, then redirect people to the LeadPages landing page and that will get them away from that scenario. Secondly, if you’re using WordPress like I do with SuperFastBusiness.com which is actually an https site, but you probably didn’t realize that, I had to put that there, the SSL security, for my shopping cart merchant. They wanted to see this https before they let me use my merchant facility. However, it’s really annoying, it’s bandwidth intensive, it’s not required for most business so my suggestion is unless you need it, get rid of it. Secondly, you can use a plugin called Mavis Https to Http Redirection, and that’s what we’re using to make all of the visitors to SuperFastBusiness.com appear as though it’s just an http site. We still put our trust seal on the footer for a little bit of trust but I suggest that you try some of those alternatives and I’d love you to come back and tell us how much your opt-ins improved. I wouldn’t be surprised if they double. Listener: Hi James, this is Melanie Richards calling. I had a question for you that I thought maybe it could be interesting if you covered in one of your podcasts. You once mentioned, well you basically talked about syndication, so you syndicate all of your news that you post on SuperFastBusiness throughout your entire website networks and I know there are repercussions with Google if you are repeating content. So, I was just wondering how you go about doing the syndication because I’m also building a network of websites and would love to have news appear all over them but without getting penalized. So if you could cover that at some point, that would be awesome. Thanks a lot, I love your stuff and keep with the great work, thanks. James: Hey Melanie, I love your Canadian accent. Okay, great question about syndication. So what we do with SuperFastBusiness when we want to tell other people about it or syndicate it is there’s two main things we’re doing. One is on some of my other sites, I have an RSS widget in the sidebar pulling the top news stories and they are nofollow links. So yes, they are the same words of the title of the post, however, because it’s a sidebar widget, it appears on a page with very different content. So if Google were to scan the entire page, only a small percentage of it will be the same word, so each page is still unique and they’re nofollow links so they’re not spammy, they’re not manipulative, they’re not going to harm SuperFastBusiness. Then the next major thing we do is we share our content, so I go to Facebook, Pinterest, Twitter, LinkedIn and I post a little blurb pointing back to the post and every time I do that, it’s original content. And then the next thing we do is, on our own sites, we actually take the same video from YouTube, we install it into LeadPlayer, which is another Clay Collins product, and we rename the title of that video and then we reword the bullet points so it’s completely original content, and this is a process called “curation”. So if we have a business news update, it will also appear on SilverCircle.com. There’ll even be a rewritten version of this Listener Comments Number 3 Show pointing back to this episode using the same media source. So if you’re using a YouTube video, use the same YouTube video; if you’re using an audio podcast, link back to the original version. Everything we do is pointing back to the authority site or it’s rewording or reorganizing the same content so that we get the same message but it looks completely new to Google for a good reason, it’s handwritten and it is fresh. 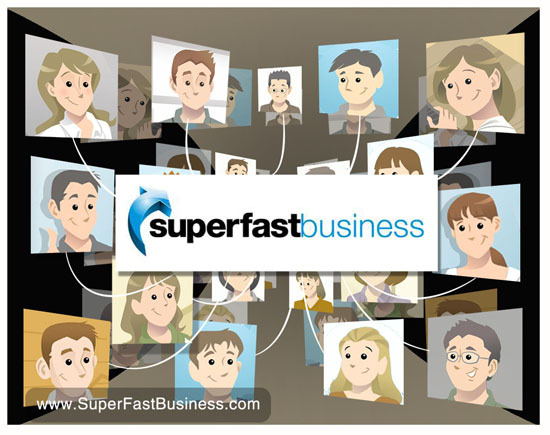 So the main thing you want to focus on is having the best core content you have on your master site, in my case it’s SuperFastBusiness.com, and the second thing you’ll want to do is to spread or share that in the most original, relevant way possible. And here is another tip. When you are sharing to Facebook or to Twitter or to LinkedIn and Google+, take the time to individualize that message for that audience because those people might be a different audience because of where they are hanging out. Listener: My mic is ready, I just need a website domain to build up my web, that’s all. James: Hey Nathan, that sounds like you’re all ready to go. Look, the easiest way to get a website built these days is to go to ATLWeb.com, that’s my web development business and we will build you a WordPress site from 199 dollars and it will be ready to go within the same day. So, check it out, ATLWeb.com. I always enjoy the postings by James and find some little nuggets every time that help to improve my business and even sometimes personal life. Thank you James. I’m glad you could use the hangout we did. I learned a lot, so thanks for taking time to do it.